All A/B tests and data shown in this presentation are not based on real experiments. They are made up just for this presentation. Making the search box hotpink will result in more searches ? You don’t want to do something if it is going to go against your theory of the case. W h a t d o e s v e r ific a t i o n b i a s c a u s e y o u t o d o ? I g n o r e i t a n d p u s h i t t o t h e s i d e . Ч т о в ы б у д е т е д е л а т ь с о с в о е й п р е д в з я т о с т ь ю ? П р о с т о и г н о р и р у й т е е е . • How big of a change you want to measure • How confident you want to be, that your test is correct How long should your run your A/B test? View Bad Evidence on Notist. 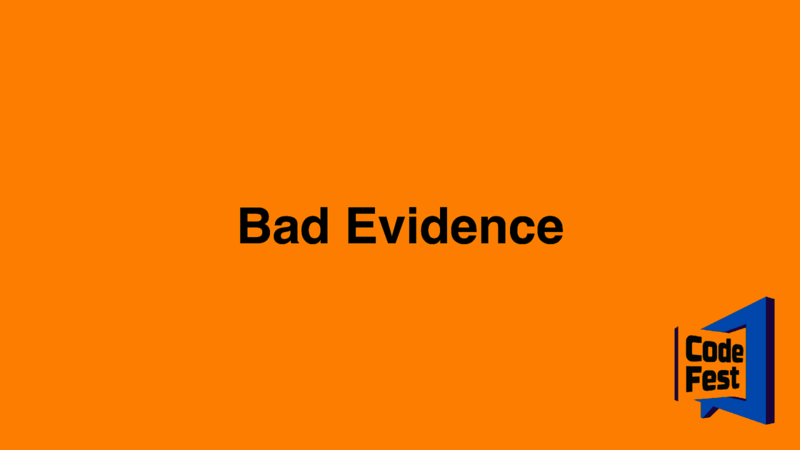 Criminal investigators have something called ‘bad evidence’ or confirmation bias. When they have a theory about a case, sometimes they tend to avoid evidence that goes against that theory. Unconsciously but also consciously. This is a big problem we have with testing product hypothesis as well. We tend to ignore the data that go against our theory. And if we do have “bad data” we can’t go around, we test it a bit longer until this disappears. Why do we do this and how do you deal with this? What other common pitfalls do we have? And is hypothesis testing really worth the time?